On 7 August 1994, Kathleen O’Hagan (aged 38 years) was shot dead by the UVF in her home near Creggan, Carrickmore, County Tyrone. Kathleen was seven months pregnant. Her other four children witnessed the killing. Her husband Paddy was out that night. The UVF claimed the killing. It was three weeks before the IRA ceasefire. “Paddy O’Hagan is still trying to come to terms with the brutal killing of his wife, Kathleen, and their unborn child, one month ago. The UVF claimed that they killed her and stated that they would have killed her husband also if he had been there that night. That is why Paddy is still afraid. Her murder, in front of her five children, shocked the whole community in Creggan and Carrickmore. Kathleen was seven months pregnant. Paddy found great support from the neighbours in Greencastle and Creggan and from the many letters from people of all creeds. Many who were themselves bereaved as a result of the conflict wrote to him to sympathise. Their messages were great – and the neighbours calling to the house helped me a lot. When we finished talking Paddy was going off to his sister’s house to collect the children. They had gone there after Mass to play with the other children. On 19 August 1997, Tomas, the youngest child of the O’Hagan family, who was an infant when Kathleen was killed, died tragically in a fire in a shed beside their house. He was 4 years of age. I attended the funeral in Brackagh in the same church in which Kathleen’s funeral Mass was held in 1994.On 11 March 2002, Paddy O’Hagan died of a heart attack, almost eight years after his pregnant wife, Kathleen, was shot dead by the UVF. He and his wife, Kathleen, who lived in a new bungalow, had been subjected to constant harassment by the British army and the Royal Ulster Constabulary. I was called to their house on a number of occasions after the RUC raids on their home. On one occasion the RUC from Omagh destroyed their home by drilling the floors and walls with pneumatic drills. They arrested Paddy and took him to Gough Barracks in Armagh city for five days during which he was tortured before being released without charge. I made a formal and official complaint. It was not the first time Paddy had been arrested and tortured. On 12 July 2008, Paddy’s son, Niall, aged 19 years, was killed in a motor cycle accident near Mountfield, Co Tyrone. The eldest son, Patrick O’Hagan, who was only five when his mother was killed in front of him, suffered a nervous breakdown. This family have depended on the support of some good neighbours and family relatives. It is a shocking story and it still upsets me. Nobody was ever charged with the horrific murder of Kathleen and her unborn baby. A tragic family cursed by bad luck and evil. Many families like them will never achieve justice and be told to accept it for the betterment of society. I wonder in the future will this come back to haunt us? In recounting such a terrible story, does it not occur to Fr McVeigh that similar tragedies have been inflicted on other families as a result of PIRA murders. Yet he writes in defence of the PIRA. Yes MT, the IRA were responsible for similiar tragedies, but their names are well known, why not Kathleen O’Hagen, because IRA victims are cynically used by the southern political establishment to try and curb the rise of Sinn Fein. I don’t know where in his piece fr Joe McVeigh has defended the IRA? I would agree Joe, I don’t see anything in the piece that promotes or endorses the I.R.A. It’s a simple telling of the facts…very tragic story indeed, like so many other stories in Our recent and distant history. And yes MT the I.R.A. have committed some terrible atrocities, that’s a given fact, but it was a brutal, dirty, messy, war, a war that would not have been necessary at all, if since Partition the Catholic People in the North had been treated with any modicum of respect at all by the corrupt, sectarian, Unionist Government in Stormount…How easily some People forget that the Catholic community in the North have been treated horribly, It is absolutely sickening to hear puppets like Enda Kenny slamming those who took a stand against the corrupt British regime in the North… Perhaps it would be worth remembering that many, many Heroes from the North also lost Their lives and liberty in the 1916 uprising and gained nothing so far for their sacrifices..I as Republican see 1916 as an unfinished revolution. Nobody has said that there is anything in this piece promoting or endorsing the PIRA. But there have been numerous apologetic pieces by McVeigh about the PIRA. Very tragic indeed. And that is precisely why it’s so difficult to understand why people like McVeigh and others are able to apologise for, and in many cases even support, similar tragedies inflicted on others by the PIRA. The PIRA terror campaign wasn’t “necessary”. So now you too are apologising for PIRA terror. Very few “heroes” from the North took part, never mind died in the 1916 “uprising”, which was an immoral unjust act that most definite should not be “finished”. Your words of support for dissident terrorists are appalling. Eh? The vast majority of PIRA crimes are unsolved. McVeigh regularly posts blogs lauding the hunger strikers and apologising for the PIRA. MT where in that story did you pick on Fr McVeigh defending the IRA? I’m referring to his other articles. What a horrific crime. How can so much tragedy be visited upon one family. My heart goes out to the surviving children and the families of Paddy and Kathleen. Unfortunately due to the southern media driven campaign of the troubles being all the fault of republicans (Sinn Fein’s electoral gains south of the border, nothing to do with this of course) there will be no regular mentions of Kathleen’s name by so-called journalists in Sunday newspapers looking for justice for this mother brutally murdered along with her unborn child and witnessed by her 5 young children, similar you would think to another mother brutally murdered, namely Jean McConville, but given the circumstances of Kathleen’s murder, her unborn child and witnessed by her children, even more heinous of a crime, but then Kathleen had the misfortune to be murdered by a British sponsored loyalist death squad in the U.V.F. and not the bad guys as the south would have us believe, the I.R.A. RIP, Kathleen, Paddy, Tomas and Niall. Of course not because the British Government was involved in it. You can hardly expect the people who were behind this double murder to give Justice to the people they murdered. Collusion is no illusion, as they say. Of course the O’Hagen family are just one of many victims of Collusion and British injustice. I’m one of the few people who didn’t lose any family to the British Army and their proxies, the UVF/UDA/Ulster Resistance/RUC/UDR/MRF/etc. Though my mother lost one of her best childhood friends when he was murdered by the British Army as a child. Needless to say, the British soldier who murdered Francis Rowntree has never did a day behind bars. If Francis was English and not Irish, I’m sure Justice would’ve been swift and served without delay. This trend of British murders and systematic injustice has gone back centuries in Ireland and continues up to this very day. The deliberate underfunding of investigations into murders, the repeated refusals to release files (most notably into the massacre in Dublin by the British Army/UVF) and the deliberate tactic of delaying investigations in the hope victims will die off, are all examples of Justice being denied. Would this happen in England? or the United States? Or France? Or Germany? Of course not. But it’s ok if it happens to Irish people, especially Irish Catholics. Over 20,000 republicans went to prison for IRA/INLA activities. Even innocent Catholic civilians were interned and not one Protestant. But yet the amount of RUC, UDR, British Army, Special Branch, etc that went to prison can be counted on one hand. The UVF/UDA were cannon fodder, they went to prison because they were the fall guys for British operations. 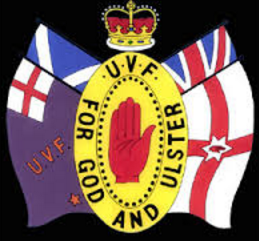 The people who were in the UVF/UDA were largely uneducated, dim and very gullible. They were mostly a crude and dim-witted bunch. They weren’t the minds behind murders/bombs. If my wife was murdered, especially being 7 months pregnant, I wont type on this blog what I would’ve wanted to do. Your wife being murdered is bad enough but being pregnant with a child just makes it far worse. It would’ve sent me insane. My mother was shot in the head by the RUC before I was born. She survived but I know if I had been alive at the time this happened I would’ve joined the IRA. Like so many people I’ve met, they joined republican paramilitaries because of what happened to them or their families or what they seen happening to their community, Internment/Bloody Sunday being maybe the biggest recruitment drive for the IRA. I think Billy Wright was behind the murder of Kathleen O’Hagen, some Justice was served when he met Crip McWilliams. But like 99% of Loyalists, Billy was run by MI5/Special Branch, he pulled the trigger but the people who planned the murder still hasn’t been brought to Justice. Many Unionist politicians disgracefully quote murders like Kathleen O’Hagens to say the UVF/UDA had “the IRA up against the ropes”. Well that’s not true, as the IRA broke the ceasefire in 1996. It was reinstated only when SF was allowed into all Party talks. As I said before on this blog, the IRA killed far more Loyalist leaders in the 1990’s, whereas I don’t think Loyalists killed one IRA Leader. I also think all of the British Governments Senior NI Intelligence experts being killed in a helicopter crash in Scotland was a massive blow to the Brits, not to mention the intensive IRA bombing campaign in England. Whether that helicopter crash was an accident or it was the IRA shot it down, I’m more inclined to think the IRA shot it down with surface to air missiles, which they just attained and used before in shooting down a helicopter in Armagh. Thankfully we’re in a better place today. But its vital that the British Government, along with their Unionist proxies, aren’t allowed to hide the Truth and prevent Justice. British state terrorism. The best terrorist practitioners in the world. Who or what gave them the right to commit violence in Ireland? how tragic and how familiar this story is. There are only a handful of victims whose names are known world-wide, Kathleen, like many others is not one of them. Who said life was precious and in particular the unborn, not true in this case. As paddy sister I am glad to see that the family are not forgotten. But justice has not being served. And the truth has yet to be revealed. If ever we can only hope and pray that some day we will get answers.